It is an unholy thing, this. It even looks wrong. It is a very strange, ingenious amalgamation of flavors. 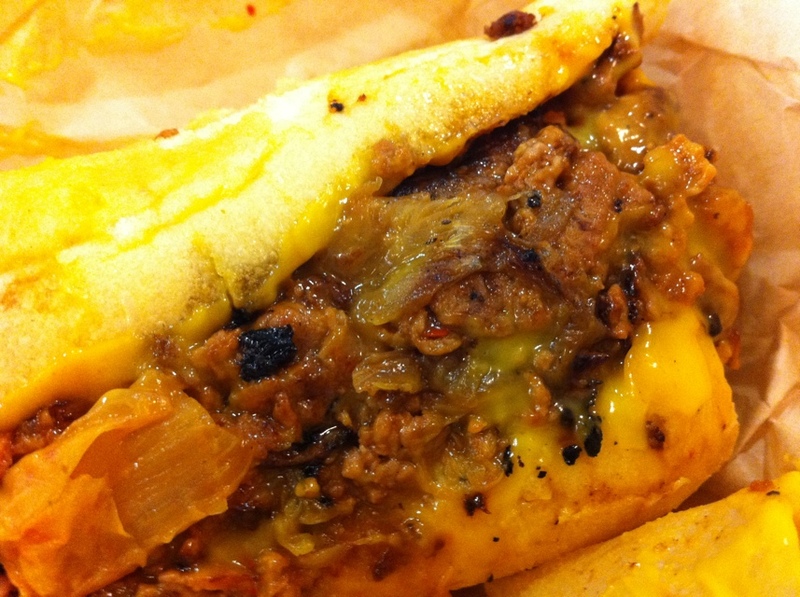 Last time I was at the Kimchi Taco truck, I decided I would try the Kim-cheesesteak, since it seemed inspired. 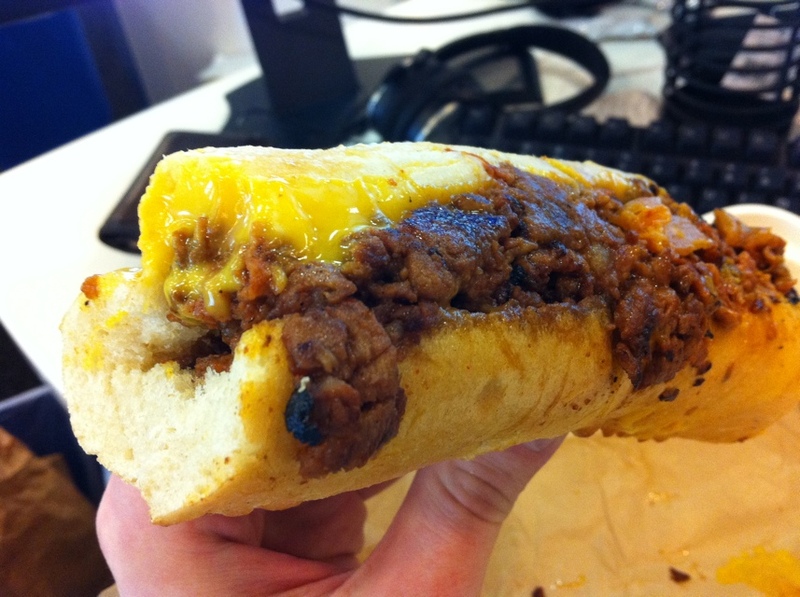 At their suggestion, I got the pork kim-cheesesteak with Cheez Whiz. There is the Korean BBQ note, the Kimchi note, but both are pretty much whipped by the Cheez Whiz, which adds the fat American cheese-esque flavor we all know. Cheez whiz spreads into a low film. It is small in stature but I’m glad there wasn’t more of it, as the whole thing comes off as an exercise in excess. I got the pork. Again, the protein flavor registers as barely there compared to the Kimchi and the Whiz. 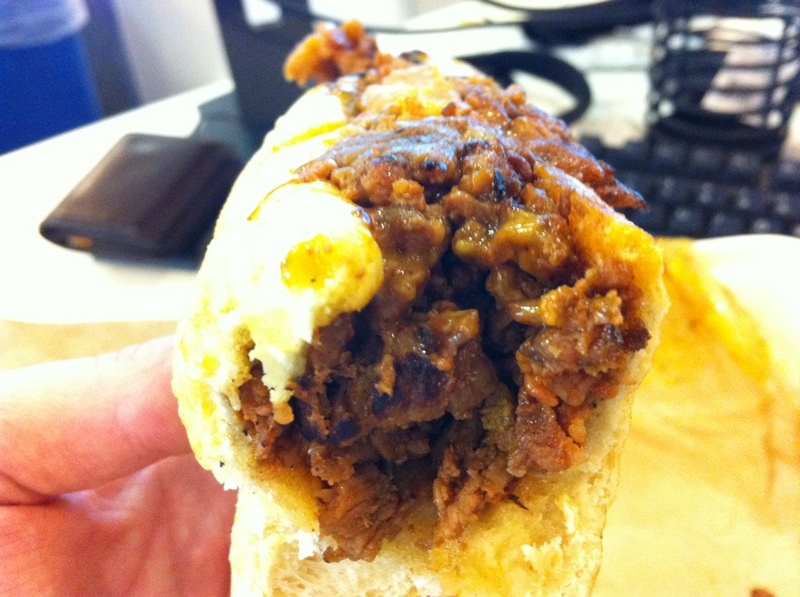 The Whiz, by the way, succeeds in coating the bun in thin layer of vaguely slimy (albeit delicious) goo. It makes the sandwich hard to handle. There are spicy and sweet sauces available, and I was lucky about to sample both. The spicy isn’t very spicy at all, but it does lend a hefty smoke note to the proceedings. The bread itself is of course sweet. With the pork, which was advertised as spicy but in fact quite mild, and the Whiz, there were plenty of sweet notes to pick up. The sweet sauce adds a faint sesame/peanut hint. I think they are on to something here, but wanted to withhold judgment until I sampled the beef/Provolone variation. My hunch was that it would allow the Korean flavors to shine through a bit more. I went back a week later to test the theory. I was right – that combination does allow the Korean flavors to shine through a bit more – but only a bit. 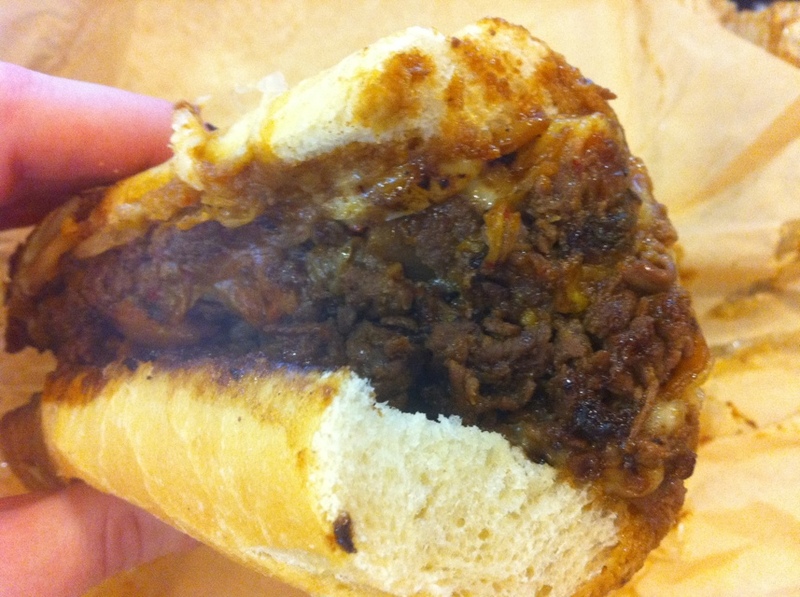 I’ve learned that when you order a Kim-cheesesteak what you get is a cheesesteak with some faint Korean inspiration/hints, not a Korean BBQ sandwich with hints of cheese. The spicy sauce (not surprisingly) wakes the whole thing up. There's the beef. Provolone seems a light touch. Turns out the cheese and bread flavors are ultimately too dominant, in my opinion, to let the Kimchi shine through. 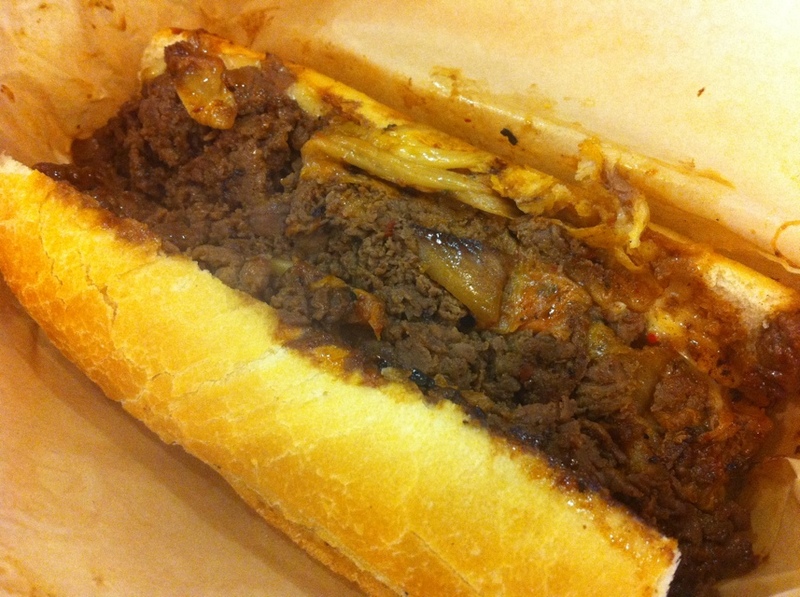 It is tasty, but I think you should get it if you’re looking to scratch your cheesesteak fix, not your Korean BBQ fix. Having been going through their menu a bit now, I think I’ll stick with their Korean tacos for now, or perhaps the bowl (yet to sample that).